1. Crystal Chemistry of Cyclophosphates (M.T. Averbuch-Pouchot, A. Durif). Cyclotriphosphates. Cyclotetraphosphates. Cyclopentaphosphates. Cyclohexaphosphates. Cyclooctaphosphates. Cyclodecaphosphates. Cycloduodecaphosphates. Ring anions in mixed anion phosphates. Thiocyclophosphates. The PO4 tetrahedron in cyclophosphates. References. 2. Stereochemical Aspects of the Redox Propensity of Homometal Carbonyl Clusters (P. Zanello). Iron clusters. Ruthenium clusters. Osmium clusters. Cobalt clusters. Rhodium clusters. Iridium clusters. Nickel clusters. Platinum clusters. Rhenium clusters. References. 3. Preparation, Properties, and Stereochemical Aspects of Inclusion Compounds of Organometallic Complexes with Cyclodextrins (A. Harada). Cyclodextrins. Ferrocene and its derivatives. Cyclopentadienyl(arene) complexes. (&eegr;6-Arene)tricarbonylchromium. Olefin complexes. &pgr;-Allylpalladium complexes. Carborane. Metal carbonyl complexes. Phosphine complexes. Optical resolution. Inclusion complexes in solutions. Inverse phase transfer catalysis. Conclusion. References. 4. Metal-Nitroxyl Interactions as Probes of Stereochemistry (S.S. Eaton, G.R. Eaton). Spin-spin interaction in rapidly tumbling systems. Interaction in a rigid lattice. Summary and prognosis. References. 5. Recent Developments on Stereocontrol Via (&eegr;6-Arene)Chromium Complexes (M. Uemura). Stereocontrol in cyclic arene chromium complexes. Diastereoselective synthesis of (ortho-substituted benzylalcohol)chromium complexes. Stereospecific carbon-carbon bond formation via Cr(CO)3-stabilized carbocations in acyclic series. Diastereoselective Cr(CO)3 complexation assisted by a remote hydroxyl group. Diastereoselective aldol reaction of (ortho-substituted acetophenone)chromium complexes. Diastereoselective 1,4-addition of organocopper reagents to (ortho-substituted phenyl (E)-enone)chromium complexes. Remote stereocontrol via (arene)chromium complexes. Diastereoselective addition of crotyl metal to Cr(CO)3-complexed aromatic ketones. [ 2,3 ]-Wittig sigmatropic rearrangement of Cr(CO)3-complexed benzyl crotyl ethers. Total synthesis of (±)-dihydroxyserrulatic acid via (arene)chromium complexes. Optically active (arene) chromium complexes and their utility in catalytic asymmetric synthesis. References and notes. 6. The Stereochemistry of Palladium Catalyzed Cyclization Reactions (A. Heumann). Addition to carbon-carbon double bonds (&sgr;-route). References. Subject Index. The role of stereochemistry to elucidate reaction patterns and physico-chemical properties in topical subjects ranging from inorganic to organic chemistry are treated in the fifth and final volume of this series. 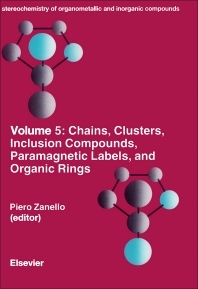 Detailed accounts are given to study: chaining in polyphosphates, electron-transfers in carbonyl clusters, inclusion of organometallic molecules in cyclodextrins, stereochemistry of paramagnetic metal complexes by labeling with nitroxyl radicals, stereocontrol in organic syntheses assisted by inorganic complexes.